Rolling Start: Congratulations to the 2005 F2 World Champion! Willie Peeters powered his way around Northampton oval today to take a well-deserved win in the BriSCA F2 World Championship. Peeters lapped consistently faster than the opposition and, following a couple of early stoppages, the outcome never looked in doubt. The defending Champion, Bill Batten, made rapid progress through the field but was forced to retire early with a flat tyre. 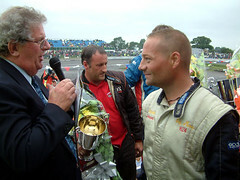 Peeters will be back in his F1 next week at Northampton. Is it possible he could take the Gold Roof in that one too? Lots more pictures and video from NIR coming soon!